Located in Mulberry United Methodist Church Cemetery in Macon County, North Carolina, just across the Georgia-North Carolina state line from Dillard, GA. Take Hwy. 441 north across the state line into NC. Turn left onto Mulberry Road (well south of Otto). The church and cemetery are on the right just past Newman’s Chapel, which is visible from the highway. When I originally surveyed Mulberry United Methodist Church Cemetery in June 2000, Albert’s stone was buried and I could not read the inscription. A recent visit resulted in the above photograph. 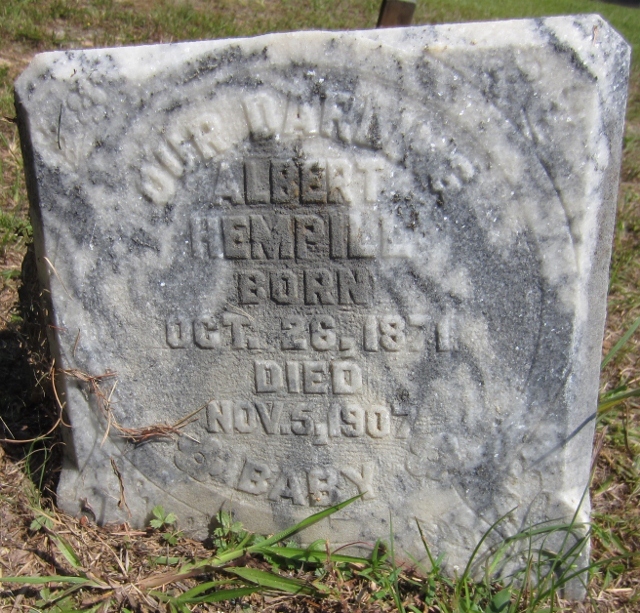 I suspect Albert may have been the illegitimate son of Sallie Hemphill, a daughter of Joseph and Caroline (Hopper) Hemphill, and a granddaughter of Samuel Hopper, an early settler whose Rabun County, Georgia, property adjoined the state line with North Carolina. The Hopper family associated and intermarried with many of the more prominent families who lived along this stretch of the border, including the Nortons and Bradleys. Sallie’s known daughter, also illegitimate, was Nancy Hemphill who married George Howard, a member of another prominent area family. I’m a bit puzzled by Albert’s marker, however. He was thirty-six when he died, most definitely not a baby, contrary to the stone’s inscription. Perhaps the family wished to have a marker and this one was the most convenient stone, for some unknown reason, or perhaps it was the only one available or affordable to the family. Something we may never know the reason behind, but a puzzler nonetheless. Wonderful find Dawn, one more piece of the Hopper puzzle. Thanks for the post. I noticed they had a servant(according to the 1900 census) named Sarah (Hemphill) age 58 who I’m pretty sure must have been James’ aunt. Needless to say, I was pretty excited about your article. My Hopper line is also through Thomas and Louisa (Ritchie) Hopper, through James Zachariah Hopper’s baby brother, Thomas Selvin Hopper. Nice to meet a “new” cousin! Sarah Hemphill was not James’ aunt. She was the daughter of Joseph and Caroline (Hopper) Hemphill. Caroline was the eldest sister of the Thomas Hopper who married Louisa Ritchie. This would make James Zachariah Hopper and Sarah Hemphill first cousins, not aunt and nephew. I don’t know anything about your particular line; that is, about James Zachariah Hopper and his wife, Ella Thomas, except that they married on 16 September 1895 in Rabun Co., GA. I have five children for them: Parlee Hopper, who married a Benfield; Margie Louise Hopper, who married Oscar Ray Fortenberry; Turner Elmore Hopper, whose wife’s name was Ann; and Odis McKinley Hopper, whose wife’s name was Lela. I don’t know who Ella (Thomas) Hopper’s family was. According to the 1900 US census, she was born in 1878 in North Carolina. My guess is that you will find her on the 1880 US census with her family, probably living in nearby Macon Co., NC. That’s just a hunch. If she were my ancestor, I would start first with her death certificate and obituary before looking at pre-1900 census records, if you know when and where she died. If not, then you would need to take a different approach. Please feel free to e-mail me (see the “About” page for my e-mail address).